Euro Motors, the exclusive dealer and distributor for luxury automotive manufacturer Jaguar Land Rover in the Kingdom of Bahrain, has announced its extraordinarily strong showing in the regionally acclaimed 2017/2018 Jaguar Land Rover Middle East and North Africa Marketing Awards with its receipt of four highly coveted awards. 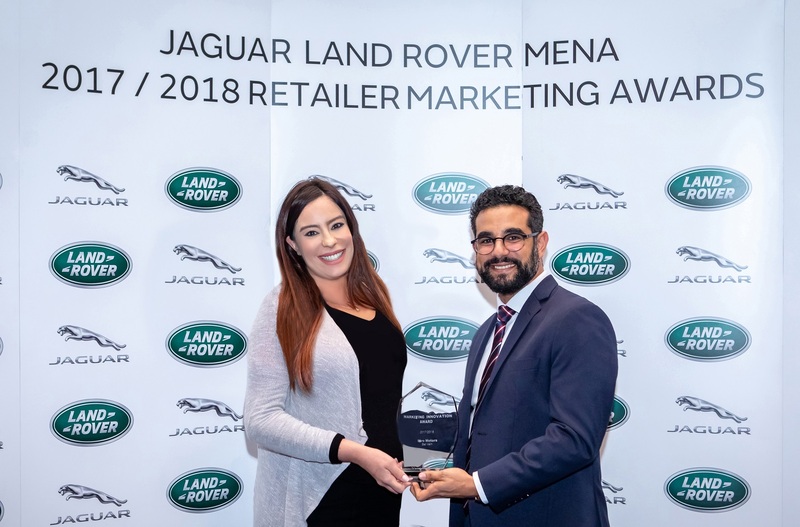 Euro Motors Jaguar Land Rover, Bahrain’s premier dealership, emerged victorious for an exceptional fourth consecutive year, with its accomplishments coming in a number of categories whilst facing tough competition from other Jaguar Land Rover retailers in the region. The incredibly consistent performance by Euro Motor’s Jaguar Land Rover saw them receive the Best PR Award for 2017/18, Best Use of Social Media and the Best APPROVED Pre-owned Programme along with the Marketing Innovation of the Year Award. Held at the Jumeirah Emirates Towers Hotel on the 4th and 5th July 2018 in Dubai, UAE, the event recognised the successes of the Jaguar Land Rover retailers in the Middle East and North Africa Region, spread over 18 countries, for the Company’s fiscal year 2017/2018. “It is truly overwhelming to have competed with renowned international dealerships and yet be able to walk tall with our heads held high for being commended for our work by one of the highest bodies in the global automotive awards circumference. This recognition from our peers in the MENA region emphasizes the significance of the proactive ventures we have taken over the past year and the outstanding essence of our work at Euro Motors Jaguar Land Rover,” she added. The Marketing Department has gone from strength to strength during the last few years that saw an extraordinary increase in the quality and quantity of experiential activities, such as the many Drive Events that have been held which bring customers closer to the brand. In order to truly cover the needs of motoring enthusiasts, Euro Motors Jaguar Land Rover recently launched the Jaguar Experience Centre which provides exclusive drives to customers, and runs in tandem with the already successful Land Rover Experience Centre at the Bahrain International Circuit. The Marketing Department consistently ran successful promotional campaigns for most of their vehicles throughout the year. A number of collaborations also took place with major organizations for various events in Kingdom including the Bahrain Grand Prix 2018, which saw a number of Range Rovers used as VIP shuttles. Euro Motors Jaguar Land Rover also hosted the semi-final leg of Jaguar’s Art of Performance Tour for the second consecutive year.